Samsung Galaxy Note 8 will be officially launched on August 23. 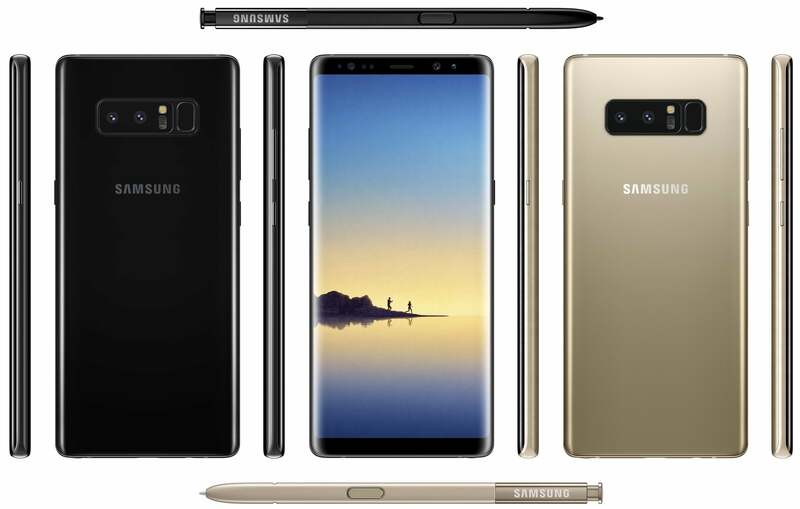 As seen with earlier Samsung smartphones, the complete specifications of the Note 8 have already leaked online. Today, the smartphone is spotted on popular benchmark site, GFXBench. And this listing suggests different display size than what it was rumoured till date. The Galaxy Note 8 will feature a 6.4-inch QHD+ display, as opposed to the 6.3-inch QHD+ rumoured earlier. 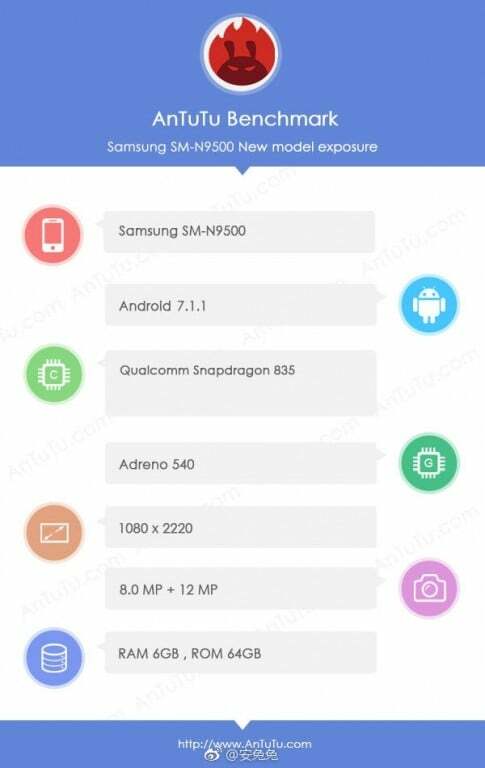 However, the same Note 8 smartphone with model number SM-N9500 surfaced on AnTuTu benchmark suggests a resolution of 1080 x 2220 pixels. Don’t be confused because Samsung allows you to change the display resolution, as seen in the Galaxy S8 and S8+. So, it’ safe to assume that the Galaxy Note 8’s display can also be tweaked. As expected, the Galaxy Note 8 will be powered by the Snapdragon 835 chipset and Exynos 8895 chipset. Samsung is upping the ante by adding 6GB of RAM to the Note 8, out of which only 5.2GB will be user accessible. 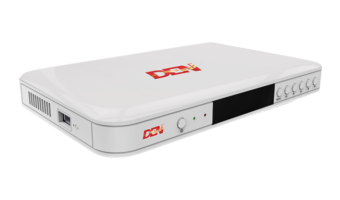 Also, there will be 64GB storage, out of which, only 53GB will be available to the user. The GFXBench listing revealed that the phone would have a single 12MP camera at the back, along with an 8MP front-facing camera. The AnTuTu listing, however, says there will be two cameras of 12MP and 8MP at the back, along with the standard 8MP front-facing camera. Previous rumours suggested that the device will arrive with two 12MP sensors at the back, and both of them will be Optically Stabilised. The device scored a healthy 179,000 in the AnTuTu benchmark, while the GFXBench scores were not revealed. In contrast, the Galaxy S8+ achieved 170,000 AnTuTu scores. 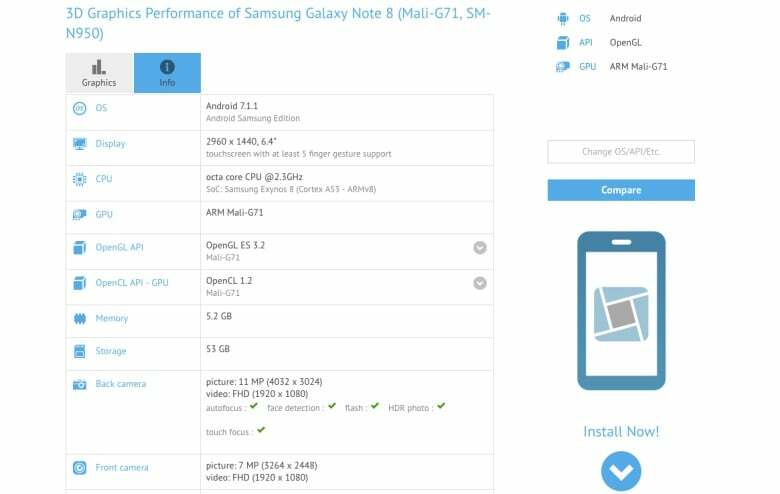 The smartphone will run Android 7.1.1 Nougat out-of-the-box with Samsung’s TouchWiz UI on top. Having said that, there are no words related to the battery capacity on the Note 8 in these benchmark reports. Earlier reports suggested a 3200mAh battery for the Galaxy Note 8. The pricing of the phone is also rumoured to be on the steeper side. Another report claimed that the phone would be up for sale in the US from August 24 itself, while the Indian launch date is unknown at the moment.